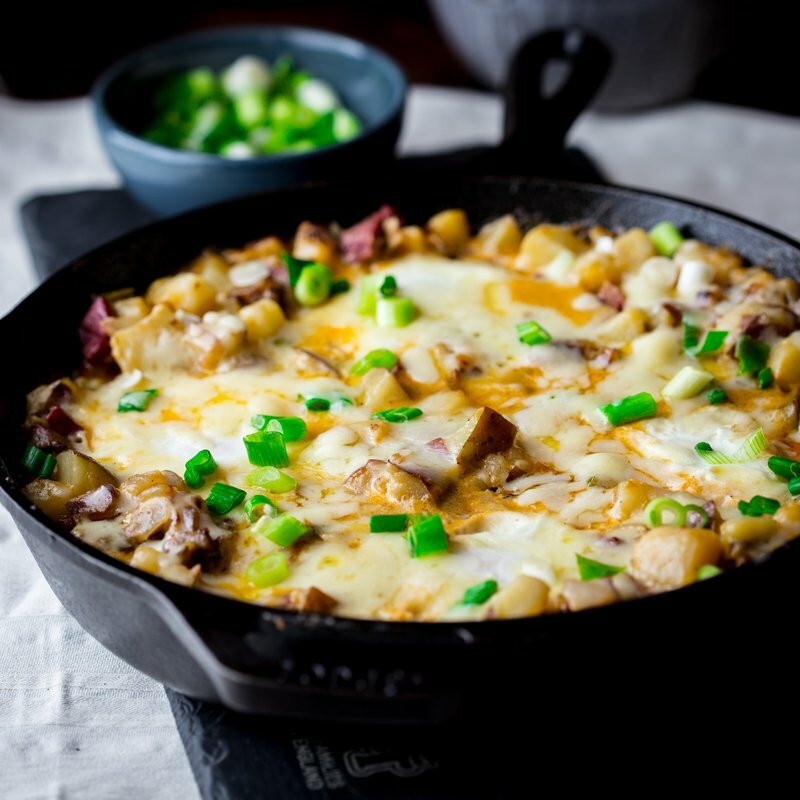 This corned beef hash skillet dish truly has it all: tender golden potatoes, savory chunks of corned beef, runny egg yolks, and sharp cheddar. This combination is sure to become a new favorite in your home, whether for breakfast, lunch, or dinner! If you love it as much as we think you will, be sure to share the recipe with friends and family on Facebook, Pinterest, Instagram, and Twitter. To make four servings, begin by gathering and prepping your ingredients. Bring about an inch of water to a boil in a saucepan fitted with a steamer basket. Add diced potatoes and cover and steam until slightly softened but not tender. Then remove the basket from the saucepan. Heat 1 tablespoon of the avocado oil and 1 tablespoon of Cabot Unsalted Butter in a 10.25-inch Lodge cast iron skillet over medium heat. Add the diced onion and green pepper and cook, stirring often until the vegetables begin to soften. Then add in the chopped corned beef, salt, pepper, and smoked paprika. Continue stirring, cooking for another 2 minutes. Add the remaining 1 tablespoon of avocado oil and stir to coat. Add the steamed potatoes and continue to cook, stirring occasionally and scraping up and turning over the potato mixture with a metal spatula. Cook until the potatoes are tender and browned, forming a crust on the bottom of the skillet, about 8 to 12 minutes. Add half and half and stir to coat. Reduce thetemperature to medium-low and create 4 wells in the potato mixture. Crack an egg into each well and top dish with 1 cup shredded Cabot Seriously Sharp Cheddar. Cover the skillet with a lid or foil and let the mixture cook until the cheese is melted and the eggs are set but the yolks are still runny, about 5 to 6 minutes. If you loved this corned beef hash, we think you’ll also love our Cheese, Sweet Potato, and Sausage Hash. Give it a try! Did you know that Cabot is a co-operative of over 800 farm families who all work diligently to produce only the highest quality products? We’d love for you to share your thoughts about this corned beef hash with eggs recipe so, if you could rate and review it once you’ve given it a try, we’d really appreciate it! BRING an inch or so of water to a boil in a saucepan fitted with a steamer basket. Add potatoes, cover and steam until slightly softened but not tender, 5 ½ to 7 minutes. Remove the basket from the saucepan. HEAT 1 tablespoon oil and butter in a 10.25-inch Lodge cast iron skillet over medium heat. Add onion and green pepper and cook stirring often until the vegetables start to soften, 4 to 5 minutes. Add corned beef, salt, pepper and smoked paprika and cook stirring 2 minute. ADD the remaining 1 tablespoon oil and stir to coat. Add potatoes and continue to cook, stirring occasionally and scraping up and turning over the potato mixture with a metal spatula, until the potatoes are tender and browned and forming a crust on the bottom of the skillet, 8 to 12 minutes. Add half and half and stir to coat. REDUCE temperature to medium-low. Create 4 wells in the potato mixture and crack an egg into each. With the cheese and cover the skillet with a lid or sheet or foil. Let the mixture cook until the cheese is melted and the eggs are set but the yolks are still runny, 5 to 6 minutes. This was really good. I roasted the veggies though.